I love it when we can sneak a little science into our play time! Mitch and I have been messing around with catapults lately and it’s been freakin’ fun. We first ran into this classic popsicle stick catapult at the Magic House maker workshop. The idea is pretty simple and there’s lots of variations. Try out a few and run some tests to see which one works best! Here’s a shopping list from Amazon (yes, these are affiliate links) to get you started. 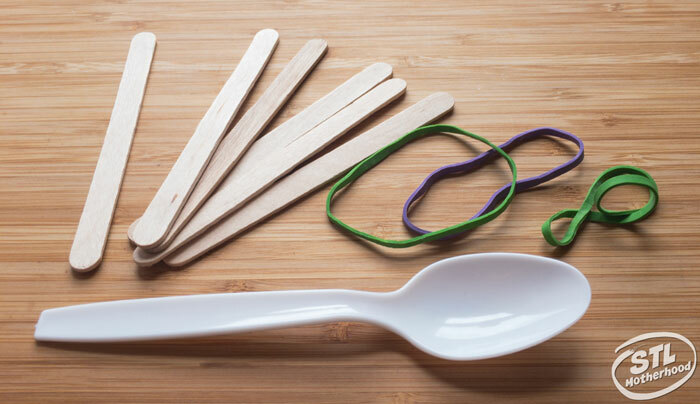 The kids might prefer to eat a box of actual Popsicles first, but it’s a little quicker to just buy unused craft sticks. This design is easy and holds your projectile pretty well. It only takes 3 rubber bands, which is especially handy if you’re rummaging through your junk draw to find crafting supplies. 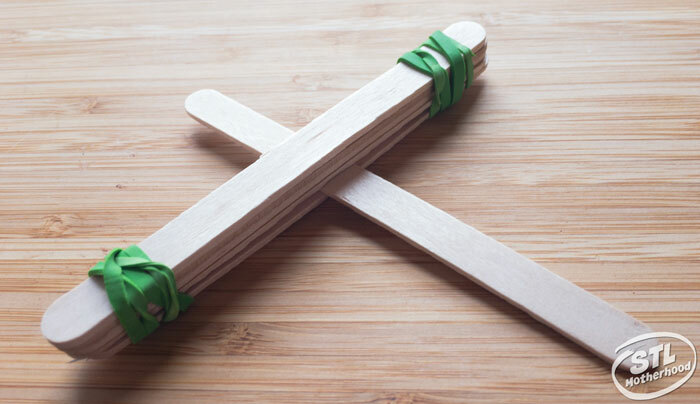 Take 5 sticks and stack them, securing one end with a rubber band. Slide one more stick between the bottom stick and the rest of the stack. Secure the other end with a rubber band. 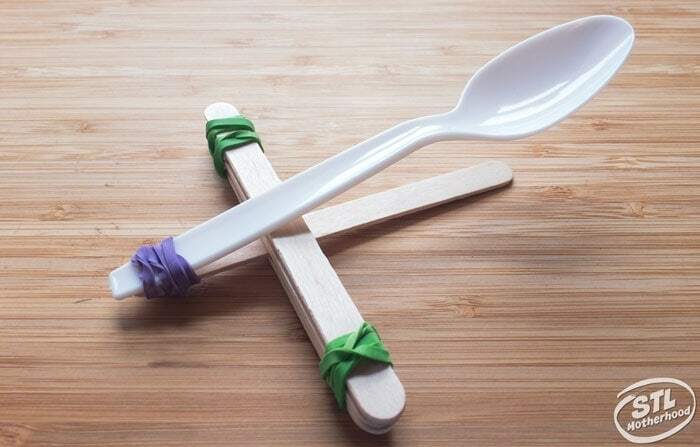 Place the spoon on top, and attach the end of the spoon to the end of the single stick with the last rubber band. Mitch and I made a little video if you want to see how it’s built and little demo at the end. Enjoy! 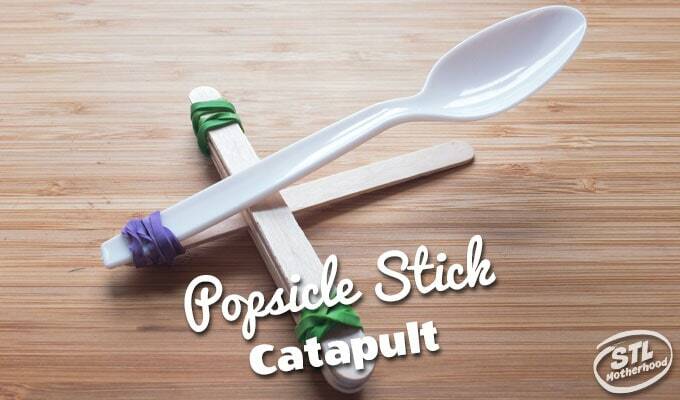 This catapult has a lot of upward thrust–not a very good distance shooter. It’s great for younger kids to build because it’s so very simple. If you’re ready for a challenge–and a bit more distance–maybe try this next one! It takes 15 rubber bands and 10 craft sticks. 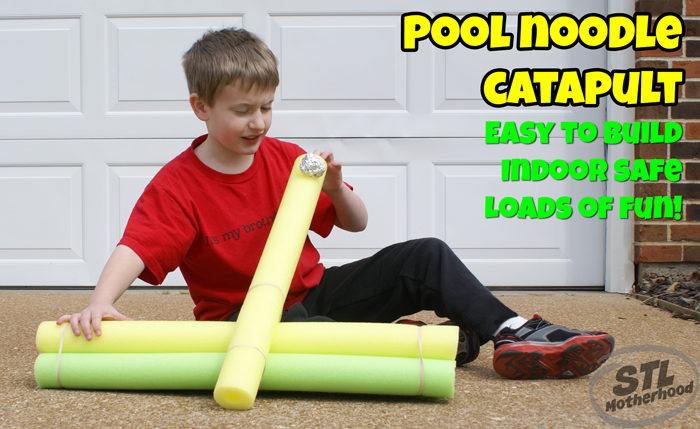 Mitch and I also made a super easy catapult from pool noodles!